Human slavery didn’t end with William Wilberforce in 1833 or in 1863 with Abraham Lincoln or in 1949 with the United Nation’s declaration that trafficking is “incompatible with the dignity and worth of the human person.” Duh! It hasn’t ended with the proliferation of abolitionist movements in recent years. But though the exploitation of millions of powerless men, women, and children hasn’t ended, and instead is the fastest growing criminal activity around the world, recovering one victim at a time makes a difference at least to that one. Some of you know that I wrote a memoir and I’m trying to get it published. It took me five years to write and hopefully less time than that to get it out. You may also know that my plan is to donate the profits from the book to an abolitionist ministry in the San Francisco Bay Area. I’ve been working as an advocate with one such movement called Freedom House, which provides long-term therapeutic aftercare for trafficking survivors. They do spectacular, albeit painstaking, work with victims whose bodies and souls have been ravaged by pimps who make a killing – literally – off of the sick lusts of rapists and pedophiles. Please consider supporting their lifesaving work. One more starfish. Hosanna Wong is an outrageously gifted Spoken Word artist whose compelling nine-minute video on this issue is both terrible and terrific. I’ve known her since she was a little girl in our church in the Bay Area in the 90s. Her dad, now in the eternally Better Place, was a San Francisco street preacher and close friend of mine. Along with his wife, Liz, several of us carry on the ministry Ed did for over twenty years in the City’s Tenderloin. If you’re looking for a visual of it, think of the worst U.S. neighborhood you’ve ever visited and quadruple its degradation. Hosanna’s captivating testimony and performance will make you feel something that you might not like feeling, but probably need to feel in order to move you to do something, even if it’s something as simple as pray. Another starfish. If you’re looking for something beyond statistics and stories and want to do something achievable, two suburban stay-at-home moms made a commitment to make a difference and wrote a book called Refuse To Do Nothing. They list a number of practical ways of getting engaged as a modern day abolitionists. 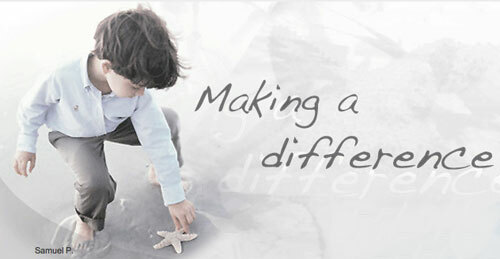 Check it out and see if one or more of their starfish-saving ideas fits you. But, as they say, refuse to do nothing! That was absolutely one of the greatest videos I have ever seen!! Such passion. Why oh why have we succumbed to such tragic depths of sin as to sell our children.